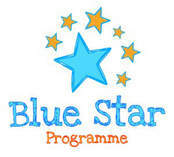 In St. Nicholas’ Primary School, pupils in 5th and 6th class are participating in the Blue Star Programme. This will require us to learn about the EU, including about its foundation and development, the member countries and their culture and how the institution operates. The Blue Star Programme is a venture of the Communicating Europe Initiative, supported by the Office of the Minister of State for European Affairs, Data Protection and the EU Digital Single Market in the Department of the Taoiseach, the Department of Education and Skills, the European Commission Representation in Ireland and the European Parliament Information Office in Ireland. Click here for Blue Star Extras!